For the month of October, please join me as we open up Roy Lessin's book, "Today is Your Best Day." I will be sharing a chapter a day, each day. Feel free to share in the comments section here on the blog, or on Facebook at the page for Marina's Kitchen Table. My prayer is that each one of us will, with certainty, see the purpose in why God has us here today. Your faith in God today is your lifeline to His heartbeat. Faith is the hand that reaches up and takes hold of God's promises and gathers in the spiritual treasures that are found in Christ. Faith sees the sunshine of God's face, even when there are dark clouds all around. It is quite an experience the first time someone flies in a plane. The sky may be covered with dark clouds, but soon after takeoff, the plane breaks through the clouds. The passenger quickly discovers that the sky is still blue and the sun is still shining, even through things look quite differently below. 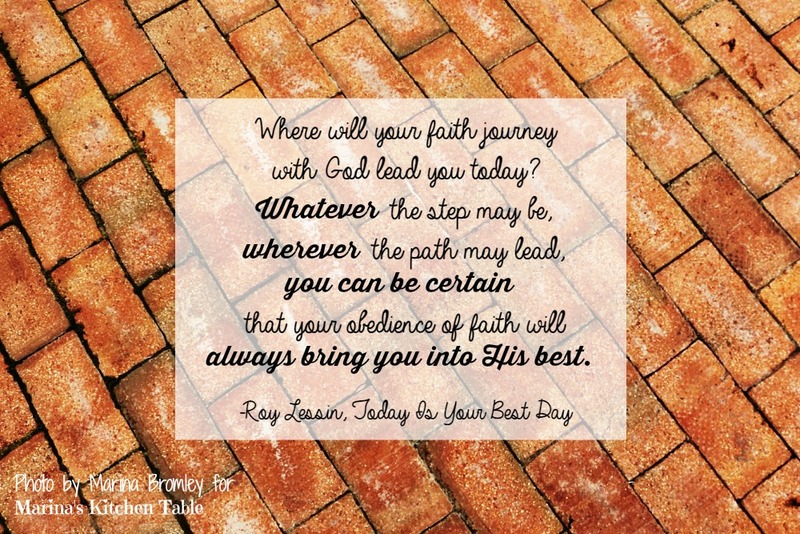 What things are possible for you today through faith? All things are possible, because your faith is in the God who knows no impossibilities. When the things that you are experiencing don't make sense, faith says, "God knows what He is doing." When your resources don't match your need, faith says, "God is my provider." When you are fearful to take the next step, faith says, "God will not fail me." When you're not sure what to do next, faith says, "God will guide me." When you are in a situation that seems impossible, faith says, "Nothing is impossible with God." When I was a new Christian living in Southern California, I applied to a Bible school in the Midwest. The school accepted my application. Along with the application, the school sent me the date that they wanted me to arrive and start my classes. I bought a plane ticket and started getting things in order. The night before my flight, the local weather forecast reported that the area would be covered with thick fog in the morning. My flight was scheduled to leave early that morning. Instead of worrying about it, I got on my knees and asked the Lord to life the fog. By faith, I knew that God would answer that prayer. I told the person who was taking me to the airport that God would lift the fog, and that my flight would not be canceled. The next morning we headed out to the airport under clear skies. Where will your faith journey with God lead you today? Whatever the step may be, wherever the path may lead, you can be certain that your obedience of faith will always bring you into His best.